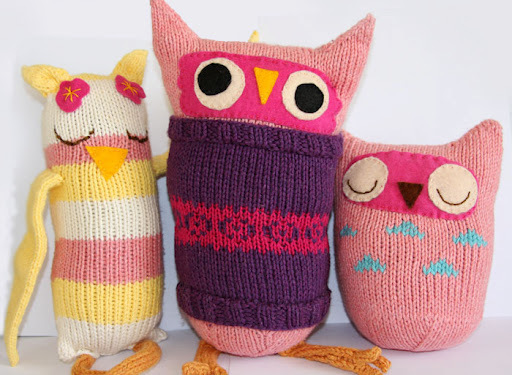 This pattern is so cute and the variety available in it with the three designs is great! The owls were designed to be a blank canvas upon which you could place color work, cables, really anything your heart could desire. Her directions are well-written and the resulting toys are wonderful. Through these, I’ve gained an appreciation for wool felt embellishments. I’ve also learned that while cotton is great care-wise, I’m not so sure I’m as in love with it for toys. It results in heavy–though sturdy!–toys that are unforgiving of any unevenness at that gauge. It’s also hard on the hands to knit cotton that tight for long periods of time. In the future, I think I’ll be stocking up on superwash wools and blends for toy making. Next up is another knit I did for Rachel…. 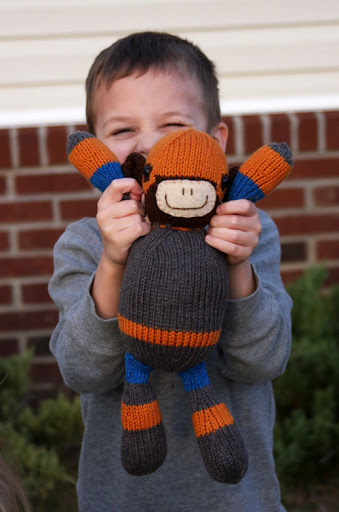 A knit super hero monkey for The Boy. (I believe it was Susan who guessed what it was during a WIP-it Wednesday post.) He was so excited to have something on needles that was for him and in colors he had chosen. Like the last pattern, this one is clearly written and easy to customize; I have some ambitious plans involving this pattern. I plan to make them after the move and they may be a bit late for their intended recipient…I’m pretty sure she knows who she is. I hate to sound like an advertisement, but I can not seem to urge you enough to go check out her toy patterns if you have gifts to knit for little people…or bigger ones that love toys. She even has a free Lorax pattern up with truffula trees! I mean seriously. Are you still here? Go have a look! Yarn: Hobby Lobby I Love this Cotton! Yes. 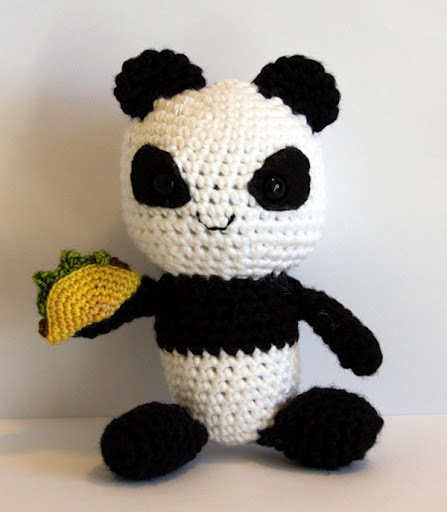 This is what the crocheted taco was all about! That was something I improvised; there is no pattern for it. I only really used the bear pattern as a jump off point and to get a feel for how to shape the bear. I ended up changing many things about the body and limbs; I think the head and ears were the only part I crocheted as-written. It was an unremarkable pattern either way. That isn’t meant as a negative remark; it just didn’t have anything noticeably wrong with it, but it was pretty sparse instruction-wise. Maybe I’m too used to knit patterns and having more descriptive information given in them? I think that’s a good place to end this post; I may as well keep it toy themed, and I can save my other FO for another time.